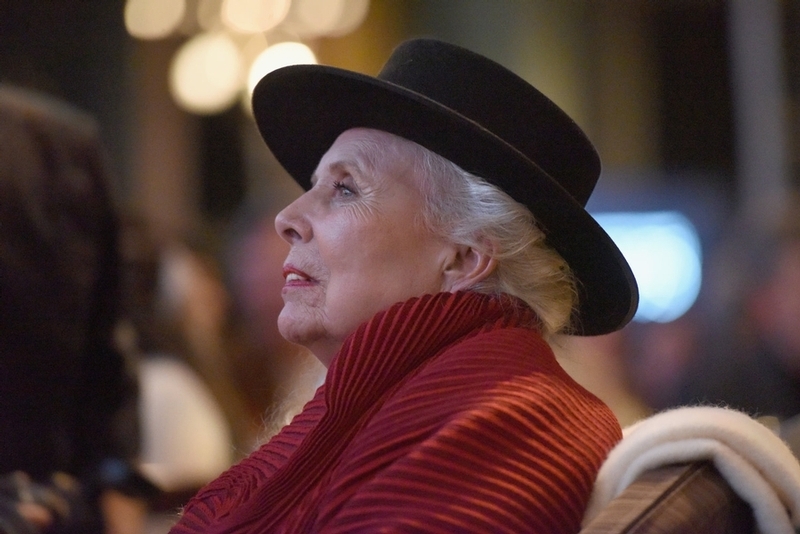 "I wouldn't have pursued music but for trouble," Joni Mitchell once said. Mitchell was referring to real problems - her childhood time spent bedridden with polio and the life-shaping loss she experienced after giving her daughter up for adoption in 1965. Those events solidified the drive that pushed Mitchell forward from small-potatoes rural Canada toward the American meccas where she would prove to be the magnet shifting the needle of pop. But trouble, in all its manifestations, is also Mitchell's muse. Call it her craving for innovation, or her refusal to rest in comforting clichés; call it the essence that makes her a secret sharer for millions of listeners' and most musicians' daunting standard-bearer. Trouble is Mitchell's jazz, the blasted-open space that can feel like a void but is also the real ground of possibility. It rings through her famous open guitar tunings and surfaces in the way her foot worries a piano pedal. It's in the impossible careening of her young soprano and the cracked resonance of the lower tones that came later. To become preoccupied with Joni Mitchell's music, whether as a fellow musician or as a serious fan, is to welcome trouble as a friend, as the challenge that animates life. Her songs ask us to live within trouble, to see the mirrors embedded in its cracks: the trouble we make, the trouble that waylays us, that makes a nest that we then fill with more trouble because we are made of it, too. In recent years, trouble has been part of Mitchell's story in a less poetic way. In 2015 she suffered a brain aneurysm, and although she has made several recent public appearances as she recovers, according to some reports she is still learning to walk again, and she has not spoken in public. Her diminished presence has raised anxiety in fans who can't imagine a world without Mitchell's voice. Recordings preserve that voice, of course, but only live performance makes it immediate. Like her prime compatriots Bob Dylan and Leonard Cohen and her favorite protégé, Prince, no one can adequately echo her; even great singers, taking on her songbook, admit they can only hope to achieve proximity. Tributes to Mitchell abound, perhaps because the potential permanent absence of her living voice feels so terrifying; these are acts of transubstantiation, attempts to take in what, in life, belongs to her alone. This week, in honor of her 75th birthday, a two-night gala benefit for LA's flagship performing arts destination, the Music Center, was crafted by loving hands to make a space for Mitchell to inhabit, likely in silence, and hear her voice come alive through her friends and acolytes. It was conceived by Music Center Director Jorn Weisbrodt, who staged a similar event in Toronto in 2013; musical producer Danny Kapilian, who served the same role at that event, has served that role at several Mitchell tributes since 1999. Bandleaders Brian Blade and John Cowherd are also veteran Joni interpreters; Blade also produced her last three recordings. The evening's staging included spectacular images of Mitchell by Norman Seeff, the photographer behind several of her most-loved album covers, and audio excerpts from the famous interviews conducted by her friend, the Canadian singer and broadcaster Malka Marom, between 1973 and 2012 (which included the quotation that opens this piece). The audience the night I attended was littered with celebrities who have been part of Mitchell's inner circle for years, including David Geffen and Cameron Crowe. A cynical person might say that all this staged intimacy made Joni 75 feel like a living wake. But her baby boomer generation is one that has long viewed legacy-making as part of an active later life. Bob Dylan didn't earn his Nobel Prize by accident; retrospective albums, films and books had been making the argument for his greatness for years. Mitchell has been attending tributes to herself since at least 1999, showing the world what the often-abused term "doyenne" really means. Listening to others enter into dialogue with her voice, she has not simply amplified her own; she has guided the preservation of its most salient qualities in others. A photograph of her sitting in one of the Dorothy Chandler Pavilion's plush seats, immersed in careful listening, evokes the process of an inimitable artist's voice living on, dispersed within the consciousness of others. At the conclusion of the second night of Joni 75, the moment many fans have been waiting for finally came. 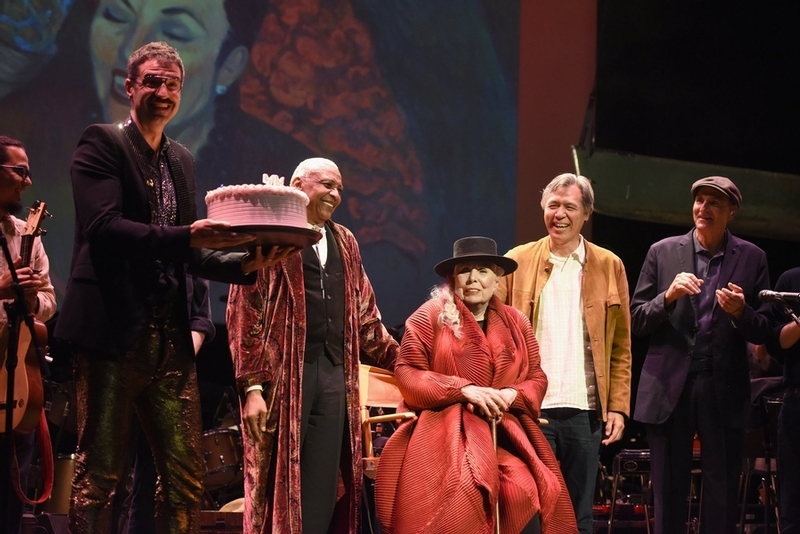 Mitchell was helped to the stage by two old friends and she stood, supported, as the evening's cast sang her 1970 bop "Big Yellow Taxi" and then blew out the candles of a birthday cake. She wore regal red and an outlaw's black hat. "She looks great!" people in the audience whispered giddily. She also occasionally looked confused or anxious, seeming to look inward to re-center herself. She is 75 years old and still recovering. The pressure in the room was palpable that Mitchell be her old self, or at least an old self that doesn't worry people. But trouble has always been inherent in what she does; not just grace, as she said in one song long ago, but havoc, always possible. Onstage, the hand-picked group of peers and protégés who had performed for her beamed confidence in her direction. It was such a human moment: joy shot through with uncertainty. Most of us have experienced something similar. Have you held your grandmother's hand as she gamely goes for a step? Or cried unexpectedly when your lover crosses the finish line after running a marathon? Or smiled hard at a toddler startled to tears by something meant to engage her? Or held the gaze of a friend bearing the kind of bad news that people tend to instantly deflect with jokes and optimistic declarations? Mitchell is human, and though she herself has not always resisted self-deification, her music has consistently made her vulnerability clear. And it is not the pretty kind. In another excerpt from an interview played at the concert, Mitchell complained of "being stereotyped as a magic princess ... you know, the sort of 'twinkle, twinkle, little star' kind of attitude." Vulnerability, in Mitchell's songs, is often dissembling, an irritant. What was most poignant about the stance Mitchell took onstage was that it wasn't simply triumphant; it was complicated. More than just a photo op, Mitchell's appearance at Joni 75 - a moment that was troubled, in the best way - reflected the entire endeavor. As a fly on the wall at rehearsals for Joni 75, I watched the stars who participated overcome their own shivers as they took on songs that demanded they deploy their best resources. Here were old friends and collaborators, including Graham Nash, Chaka Khan, Kris Kristofferson and James Taylor, and more recent protégés, from Seal to Diana Krall. These were people who had recorded with Mitchell, hung out at her house or even lived with her. They've won awards for covering her songs and sung them every night on their own tours. There were also a few less closely associated acts who nonetheless had been carefully chosen. One of the highlights of the program was the collaboration between East LA's greatest band, Los Lobos, and leading younger Latinx music lights La Marisoul, Cesar Castro and Xochi Flores, on Mitchell's percussive masterpiece "Dreamland." The original recording featured a percussion circle that included percussion greats Airto Moreira, from Brazil, and Manolo Badrena, from Puerto Rico. Khan, who sang on the original "Dreamland," added Latinized jazz vocal lines. By taking that song to the California-Mexico border, this ensemble renewed it for a new century - and connected it to a different kind of trouble, one that music seeks to overcome, at least symbolically, with joy. I watched other cast members deconstruct classics and stitch them back together with thread they'd taken from Joni's own closet. Taylor, for example, found a way to do "Woodstock" that honored both the propulsion of the hit Crosby, Stills, Nash and Young version and the delicacy of Mitchell's own recording. Krall, for whom Mitchell's music was a bridge from straight jazz to the more eclectic music that made her famous, played the close reader on "Amelia" and "For the Roses," her interactions with bassist Christopher Thomas suggesting thorny conversations she's had with herself about these songs for years. Artists like Krall have thought hard about how Mitchell's work is not exactly like their own, and how they could take on the challenge she poses without getting lost in imitation. Mitchell's music is a problem they have to solve, not only because of those tricky tunings and her verses crammed with cascading syllables. Most songs, even great ones, eventually land in one place: They may flirt with irresolution, but in the end a major chord or a cleanly turned cliché resolves it all. Not Mitchell's songs. As she wrote in "A Strange Boy," which Seal performed with steely conviction, Mitchell's music weaves a course of grace and havoc, as does life itself. Staying with it demands clarity. Perhaps one reason Mitchell's music is so often the subject of tributes is that open-ended quality. It makes room for others to take risks; in fact, it demands that they do.The work of only a few popular musicians is expansive enough to be adapted in this way, and the Joni 75 concerts showed why so many organizers of these kinds of events turn to her songs. For one thing, they allow for a great band to stretch out without having to be showy. Under Blade and Cowherd, this one continued to establish a template for honoring her. The ensemble featured many players known for gently saying no to any confinement within genre or style: the trumpeter Ambrose Akinmusire, the guitarists Marvin J. Sewell and Greg Leisz and the percussionist Jeff Haynes. In arrangements that expanded or intensified her originals in finely drawn increments, these players made some of pop's most confounding song structures easeful without going soft. They let in just the right amount of noise to remind us of Mitchell's commitment to trouble, the dark energy ever expanding within. Some choices the cast of Joni 75 made reminded listeners, as Mitchell often does, that trouble can also be fun. Khan, one of the prime interpreters of Mitchell's music, found that playfulness tinged with a sense of risk in every phrase she sang. This was especially true of her reading of "Two Grey Rooms," a later Mitchell song that, in some ways, comes as close to the blues as she ever would. A desolate tale of unrealized desire, Mitchell's version is weirdly pretty; maybe she was thinking of a similar song, the Temptations classic "Just My Imagination," when she added choral harmonies that sweeten the sorrow. Khan, who recorded "Two Grey Rooms" in 2005, goes rougher. At the Music Center she hit her notes hard, finding the groove within Mitchell's dreamy isolation; finding, possibly, a way out. The fun Khan found in Mitchell's sad song reminds us that there's a reason people court trouble. Mitchell, of course, also understands this playfulness. If I must indulge in the tradition of critics quoting her songs as a way of describing them - because none of us are as incisive as she can be - let it be here: Laughing and crying, she knows, it's the same release. As Mitchell's music becomes repertoire, it continues to challenge listeners to make room in their hearts for more than one feeling at once. In 2018, there can never be enough reminders that human experience is only enriched by self-reflection; by listening, quiet and solitude. Returning to Mitchell's songs now offers that precious gift: It reminds us that art comes not just from unexpected encounters - between people, cultures, the past and the present and the world of dreams - but from nurturing, from practice and the willingness to simply take time to make the work better. Joni Mitchell took that time. She faced down the trouble that simply living inevitably raises: the heart breaking, mending and scarring as time goes by; the soul shedding layers in the slow and sometimes untrustworthy process of enlightenment. Now we can see her as someone who, like all of us, lives with imperfection. It's something she always acknowledged in her songs, despite or maybe because of her overwhelming aura of mastery. Trouble was a teacher for her, though not a gift. Would that we all could find the power in knowing that. This article has been viewed 1,578 times since being added on November 9, 2018.